We think small about the gospel. Over the past fifty years, Christians have usually defined the gospel like this: “We sinned, Jesus died, trust Jesus, go to heaven instead of hell, the end.” This is a very small understanding of the gospel. It’s true, but it’s not the whole truth. That kind of gospel doesn’t actually change our world. But that’s the kind of gospel we usually preach and teach. We imagine and live a small gospel. We think big about the world’s problems. Every year, two million children die because of bad water and bad toilets. Over one billion people do not have clean drinking water; three billion people live every day on less than the cost of a cup of coffee ($2.50). These numbers help us understand the reality of our world. But we can get lost in this kind of reality. Who can feed a billion people? How can you stop two million children from dying this year? The problems are too deep. The numbers are too big. So what do we do? We shut down. We pretend like half the world isn’t stuck in hopeless poverty. We pretend that Jesus doesn’t care if we ignore them as long as we go to church and say our prayers and read our Bibles. But it doesn’t have to be this way. We need to think big about the gospel. Jesus said things like: “Change your life. Believe the good news.” And how did Jesus explain the good news? Jesus said the gospel was that the Kingdom of God is right here among us (Mark 1:14-15). The gospel is that the Kingdom of God is breaking in among us. No matter how broken and messed up we are, God can put us back together and give our lives a fresh start. No matter how broken and messed up our world is, God is at work to bring healing and grace and salvation. The gospel starts with us. We have to change. The gospel is that we aren’t stuck. God can change us. But that’s not the whole gospel. The whole gospel is that God wants to change the world through us. We need to think small about the world’s problems. Our world is a mess. Billions are malnourished, have bad water, and can’t go to school. We know this, and we understand these numbers on some cerebral level. However, we are humanly incapable of thinking deeply or emotively about millions and billions. We need smaller numbers and smaller pictures to make personal connections to the world’s problems. We need to think in terms of a number we can all understand: ONE. ONE is the fundamental concept of missional partnerships. Together, we can change the world through one-to-one relationships. Missional partnerships enable us both to think small about the world’s problems and to think big about the gospel’s power to change our world. What Is a Missional Partnership? Partnership is a buzzword in missiology, academics, and business. At its core, partnership means working together to achieve synergy. Missional partnerships are long-term relationships between two or more missional organizations with complimentary needs and gifts focused on achieving common goals which benefit both organizations in their kingdom work. Primary partners could be local churches, districts or groups of churches, schools, business, clubs, NGOs, or specific ministry programs. Each group gives and receives. Most partnerships last at least three years and involve a wide scope of activity, including prayer support, mutual communication, financial support, and short-term personnel exchange. Missional partnerships are enduring relationships fueled by the Spirit, which contribute to the transformation of both communities. Missional partnerships are not mechanical. They are a great organic tree growing from the roots of Christianity. Let me share six of these roots. The Trinity is partnership. One in essence, one in mission, unified yet distinct, the Father, the Son, and the Spirit flow in perichoretic partnership. Each Person sings a harmonizing part in this great opera. In the great beauty and mystery of the gospel, our world is an open drama. The loving, healing, creating Trinity invites our voices and bodies and minds into the ongoing opera of life. Our Trinitarian God sweeps us up into the great partnership and links us together into smaller choirs and movements in the great operatic mission of redeeming love. Missional partnerships are fueled by a burning desire to participate firsthand in the mission of God. Our people are no longer content to sit on the sidelines or to give from afar. The lines between “going” and “sending” are blurring into a happy cloud of missional activity saturating our churches. Furthermore, our understanding of the mission of God is expanding to its true biblical proportions. When we preach and understand God’s great mission as the total restoration of the global community, our inner passions are awakened and aligned with the movement of God’s Spirit. This missional passion is propelling us into partnerships. When the world is at our fingertips, it must also be at our pulpits, our budget meetings, our small groups, and our dinner tables. If we cannot address poverty honestly and directly, we cannot preach the gospel. Without confronting injustice, we lose the authority to proclaim God’s reconciliation. Perhaps more than any generation in a thousand years, we understand our interdependence. We live in a global village, and the Body of Christ has more visible connecting sinews than ever before. Even if we don’t yet fully understand why or how, a profound sense of mutual need is dawning in our collective conscience. There is no social, psychological, or spiritual substitute for loving service. God uses missional partnerships to sanctify us in a way that nothing else can. Jesus took on flesh and blood as a first-century Jew, speaking in the language of his culture to the issues of his culture. We too must follow his example of deep cultural incarnation. We must seek to be thoroughly in our culture while opening the way for a Voice of Challenge that is not of our culture. Our globe is trending resolutely toward cross-cultural and cross-sector partnerships. Alan Fowler proclaims, “Today’s rule of thumb in international development is that everybody wants to be a partner with everyone else on everything, everywhere” (2000, 1-13). As Thomas Friedman explains, “The world is flat.” Because our global connections now have the potential to be deeper, broader, and multi-layered, successful organizations will make them so—or be left behind (2006). Furthermore, we are experiencing the customization of everything. Yet, in a choice and luxury-saturated culture, people attach meaning to personal stories. Consumers are trending toward products with an interesting story (Pfanner 2010, 15). Charitable giving is following the same trend. Kiva is undeniable proof of our society’s increasing demand for personal involvement and personal choice. Donors browse lists of micro-entrepreneurs in developing nations, meet their families, see their business plans, and make a small loan to that person. Kiva made its first loan in 2005, and has now loaned around $500,000,000, all through customized microloans (2013). In our flat, wired, networked world, individuals everywhere want influence over everything. None of us have as much control as we want, but we are increasingly exercising the control that we do have. We know that we need governments and NGOs and institutions. However, we will not tolerate structure without clear purpose. In this context, then, the exodus of young adults from a top-down, administration-heavy, isolated church becomes more understandable. When surveyed, three of the top four complaints of the de-churched are the church’s boredom, irrelevance, and hypocrisy (Hamm and Beemer 2010, 29). A whole generation is losing faith in the church because the church is not effectively living Jesus’ gospel of global redemption. However, the problem is cultural as much as theological. This generation wants to touch the action personally. When we give, we want more control, creativity, relationship, visible results, and personal involvement (Webber 2007, 15). When we don’t find those options in the church, we look elsewhere. Our most basic task is to re-evangelize the Church. We have come to believe the gospel is some small isolated thing that relates only to our eternal salvation, but not to our work, homes, economic systems, health care, or daily lives. However, as we truly participate in the gospel’s healing flow, we ourselves are healed of our soul-killing selfishness, materialism, and prejudice. Personal participation in world evangelism and compassionate ministry actually evangelizes us. The mysterious shrewd manager of Luke 16 calls out, “Leverage your social capital.” He reminds us that relationships carry an even weightier currency than money. Missiologist David Wesley explains the catalytic effect of missional partnerships using the concepts of collective impact and social capital. For complex problems, we need complex solutions with input from people and organizations across all sectors. Missional partnerships leverage a congregation’s social capital to address a significant problem that is too large for any one group alone. Sustained engagement by the central organization builds momentum. Eventually, a healthily-leveraged partnership develops its own gravity, drawing into its orbit a variety of partnering individuals and organizations. • The Gates Foundation and Columbia University helped to fund and develop an AIDS prevention center. • A massive solar-powered water well initiative connected with SAI/Servant Forge, Nazarene Compassionate Ministries, Coca-Cola Africa, and USAid. • The South African and Swazi governments joined hands with the church in the Swaziland Task Force. • The Luke Commission established medical centers in Nazarene schools and provided a platform for doctors from Bethany to work in Swaziland on short-term trips. Missional partnerships offer churches the opportunity to involve like-minded individuals and organizations from across the global and religious spectrum in a common mission. A single church’s partnership can become the leveraging factor for a wide network of missional change (Wesley 2012). Considering the depth of these theo-social roots for missional partnerships, the question is not if but when and how missional partnerships will become widespread. “The problem of sharing partnerships with Europeans,” explains Kenneth Kaunda, former president of Zambia, “is that it is like sharing a three-legged stool with someone who has a very big backside.” Philip Thomas elaborates, “For Western Christians the challenge of partnership is to find better ways of sitting together in the world church” (2003, 392). There are a number of things a partnership must have. #2. Time. According to Phillip Butler, “Effective collaboration is a process, not an event” (n.d.). Trust builds through mutual commitment, faithfulness, and understanding, and it will take time for each partner to authentically understand the expectations, the methods, and the social reality of the other partner. Healthy partnerships are multi-year relationships. #3. Structural support. Independently-established partnerships can be damaging to one or both partner communities. Partnerships are most likely to flourish within a system that promotes, facilitates, supports, and evaluates (such as an experienced denominational office or NGO). #4. Mutuality. The larger goal is the transformation of both communities through the Spirit’s work in the missional partnership. Financial giving is a healthy element of partnership. However, this giving must be wrapped into a larger relationship of many forms of giving and receiving. It is essential that both groups enter the partnership expecting to learn from the other. Similarly, there are a number of boosters that can help a partnership. #1. Layers. The most effective partnerships have many layers of partnership woven together. A single partnership may involve short-term trips, child sponsorship, ministerial training, prayer support, joint worship services, long-term volunteers, microfinancing, joint artwork, and on and on. The goal is to incorporate the threads of the partnership thoroughly into every part of the local organization. #2. Localization. Whenever possible, the developed nation partner will find ways to mirror its partnership locally. For example, the local church engaging in an international partnership serving AIDS victims may seek to minister to those same people in the same region as their partnership. #3. Focus. A laser’s strength is in its intense focus. Exceptional partnerships incorporate a congregation’s international involvement into a single frame of reference. Fragmentation dissipates inspiration. Focus intensifies passion. There are six things to keep in mind when starting a missional partnership. #1. Assemble a development team. The ownership and buzz your organization has for your missional partnership will be in direct proportion to how many people you invite into the process and how effectively you communicate during the investigative process. #2. Soul search. Consider your group’s strengths, natural connections, and passions. Does your community have a large group of Southeast Asian immigrants? Are some of your leaders already interested in a particular cause, like clean water or human trafficking? #3. Gather and filter partner proposals. Actively recruit as many proposals as possible. Research each option thoroughly. What are the national and local demographics? Have they coordinated with similar partnerships before? What is their capacity to work effectively with your organization? Who will be the cultural broker for your partnership? How well do you know and trust the cultural broker and his or her organization? Slowly and prayerfully filter the prospective partners until you have two or three finalists to present for a church-wide poll. After the poll, allow your leadership board the final decision. #4. Start with a quick win. My local church in South Korea immediately gave our partners in Bangladesh $1000 to distribute blankets during an extreme cold snap. Find something you can do right away to generate positive energy for the partnership within your church. #5. Take an initial visioning trip. You need to put feet on the ground as soon as possible. You may choose to fund and to work on a small project on this initial trip, but the overwhelming emphasis should be on fact finding, learning the culture, and developing relationships. After this trip, your leaders will have a much better grasp of how to proceed with the partnership most effectively. #6. Incorporate the partnership into the fabric of your organization. Our church used offering baskets from Bangladesh, gave five percent of our general offering to Bangladesh, prayed for our partners regularly in our worship services, and sponsored kids in Bangladesh through our families, Sunday School, youth group, and children’s church. “A cord of three strands is not easily broken” (Ecc. 4:12), so make as many connecting strands as possible. We can change the world and become the people that God is longing for us to become. We can think big about God’s amazing gospel, which has the power to redeem our whole world. And we can think small, engaging our world one community at a time. Through missional partnerships, all this is possible. Claiborne, Shane. 2006. The Irresistible Revolution. Grand Rapids, Mich.: Zondervan. Fowler, Alan. 2000. “Beyond Partnership: Getting Real about NGO Relationships in the Aid System.” IDS Bulletin 31(3):1–13. Friedman, Thomas. 2006. The World Is Flat: A Brief History of the 21st Century. New York: Farrar, Straus, & Giroux. Hamm, Ken and Britt Beemer. 2010. Already Gone: Why Your Kids Will Quit Church and What You Can Do to Stop It. Green Forest, Ark. : Master. Kiva. 2013. www.kiva.org/about, August 5. Lee, Hong-Jung. 2002. “Beyond Partnerships Toward Networking: A Korean Reflection on Partnership in the Web of God’s Mission.” International Review of Mission 91(363): 577. Maddox, Randy. 1994. Responsible Grace: John Wesley’s Practical Theology. Nashville: Kingswood. Pfanner, Eric. 2010. “Exclusivity Finds Niche on the Web.” New York Times, Global Edition, November 22. Thomas, Philip H. E. 2003. “How Can Western Christians Learn from Partners in the World Church?” International Review of Mission 92(366): 392. Webber, Steve. 2007. “A New Generation of Donors.” Presentation to the Regional Directors of the Church of the Nazarene. February 15. Nazarene Headquarters, Kansas City. Wesley, David. 2013. “Cultural Brokers: Trust and Communication.” April 27. Accessed December 4, 2014, from www.actsoneeight.blogspot.com/2013/04/cultural-brokers-trust-and-communication.html. _____. 2012. “Collective Impact in Mission.” Didache. Summer. Josh Broward splits his time building missional communities at Duneland Community Church, teaching at Olivet Nazarene University, and fighting human trafficking with Free The Girls (www.freethegirls.org). You can follow Josh on Twitter at @JoshBroward and at his blog: www.humblefuture.com. EMQ, Vol. 51, No. 2 pp. 180-189. Copyright © 2015 Billy Graham Center for Evangelism. All rights reserved. 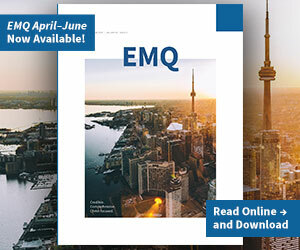 Not to be reproduced or copied in any form without written permission from EMQ editors.